James Cohan is pleased to present an exhibition by British-Nigerian artist Yinka Shonibare MBE, the artist’s sixth at the gallery. Prejudice at Home: A Parlour, a Library, and a Room will feature three major installations, which together demonstrate Shonibare’s multivalent approach to the theme of “otherness.” The works span two decades of wide-ranging explorations into individual and collective identity as viewed through the lens of history. Today, these artworks wield an ever greater urgency as a reminder that unchecked prejudice can cripple a society. On view are the freestanding installation The Victorian Philanthropist's Parlour (1996-97) the photo suite Dorian Gray (2001) and the US premiere of Shonibare’s more recent large scale work The British Library, which has been a sensation since its first presentation at the Brighton Festival in 2014. 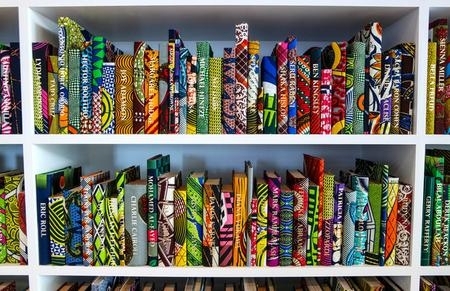 Yinka Shonibare’s visually stunning installation The British Library reflects the positive contributions that immigrants bring to their adopted lands. ​The work is a collection of 6,000 books arrayed on shelves and bound in the artist's signature brightly colored, Dutch wax cloth. On the spines of the books are the gold embossed names of individuals, both celebrated and unfamiliar, such as T.S. Eliot, Henry James, Hans Holbein, Kazuo Ishiguro, Zaha Hadid, Mick Jagger, George Frideric Handel, and Anish Kapoor who have made unique contributions to British culture as well as those opposed to immigration such as Nigel Farage, Joan Collins and Jonathan Arnott. At a time when immigrants are vilified by nationalist trends in increasingly divided, developed nations, Shonibare’s The British Library asks us to consider the global migration of refugees and what would be the state of society without the contributions of immigrant populations. A web component of the work accessible on iPads in the installation allows visitors to explore the complete list of names on the books, video documentation about immigration and has space to record their own stories on iPads set up in the installation. The British Library was originally co-commissioned by HOUSE 2014 and Brighton Festival for the Old Reference Library at the Brighton Museum and Art Gallery. The installation has since been shown at Museu Afro Brasil, São Paulo and Turner Contemporary, Margate. In our new Gilded Age in which inequality runs rampant, Shonibare’s filmic suite of twelve photos Dorian Gray (2001) remains a potent metaphor to explore the roots of power and the constructs of social hierarchy. The suite references both the The Picture of Dorian Gray and it's dandified author Oscar Wilde, known for his flamboyance and persecuted for his homosexuality. Shonibare casts himself, a disabled black man of African origin, as Dorian Gray, whose narcissism and outsized sense of power leads him to believe that he is a master of the universe, able to defy the laws of nature. The artist, like the author, is the outsider assuming the position denied to the 99.9 percent. Yinka Shonibare MBE (born 1962 in London, UK) is a member of the ‘Young British Artists’ generation who came to prominence in the late 1990s. His works have been featured in Documenta10 (2002) and the 52nd Biennale di Venezia (2007.) From 2008 thru 2009 a major mid-career survey toured from the MCA, Sydney, Australia to the Brooklyn Museum. New York and Smithsonian’s National Museum of African Art, Washington, D.C. In 2011, the artist’s sculpture Nelson’s Ship in a Bottle was a Fourth Plinth commission in London’s Trafalgar Square. In 2013, a major touring survey was mounted at Yorkshire Sculpture Park, UK. In 2014, Shonibare was the subject of the first contemporary art exhibition at The Barnes Foundation, Philadelphia, PA. In the past two years, solo exhibitions have been on view in Montreal, Canada; Deagu, Korea; New York, NY; Hong Kong; Carlow, Ireland; Margate, UK; Memphis, TN; London, UK; Kiel, Germany and Singapore. In Fall 2016 Yale Center for British Art mounted a solo show to celebrate their reopening. Concurrently, Yinka Shonibare MBE has contributed the only contemporary work to the groundbreaking exhibition Enlightened Princesses: Caroline, Augusta, Charlotte, and the Shaping of the Modern World at Yale Center for British Art. Recently, Yinka Shonibare MBE was featured on PBS Newshour on the occasion of the permanent installation of Wind Sculpture VII at the Smithsonian’s National Museum for African Art and he was a recent guest on BBC's Desert Island Discs. Please direct further inquiries about Yinka Shonibare MBE to Jane Cohan at jane@jamescohan.com or 212.714.9500.